Sometimes, the act of finding something to be happy about on a daily basis gets a little help. Witness this, seen in the morning as I was heading to the office. I have no idea where it came from. It appears the wind carried it to the yard where it entangled itself around that fern on the north side of my neighbor's house. It made me giggle. 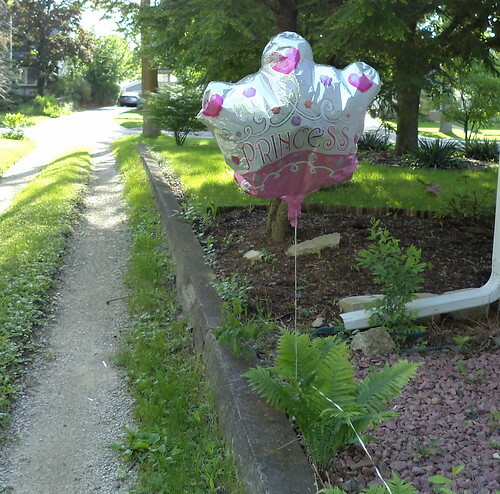 I'm fairly certain the gals next door would not define themselves as "princesses". Lord knows I certainly don't. Still, this started the day with a laugh and we could all use one of those. It was gone when I got home. Now, bring me a bag of Oreos and some milk while I put my feet up in the recliner and watch a movie. Make sure you bow when entering and leaving my presence.